Kinda’ like shooting a model or still life, I know exactly where my subject is going to be and (more or less) what pose they’re going to be in. That makes setting the output (or power) of the flashes easy. The problem with shooting skateboarding is that the subject needs both a runway to and from the spot where the picture will be taken. This often doesn’t allow you to put the light stands where you want them. 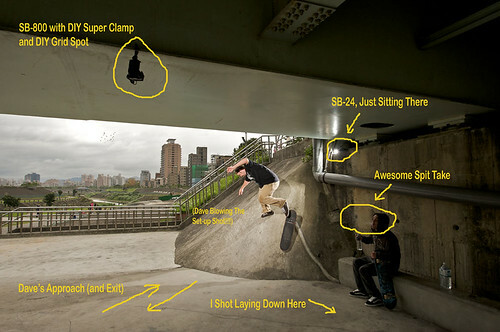 You also have to worry about the subject falling, shooting his board out, and knocking over your expensive new flashes. Meet the home-made, DIY super clamp! Man, I love these things! For this picture, I wanted the flash to be set directly in the path of Dave’s approach to the bank. Luckily, we were under a bridge so I attached the DIY super clamp and Nikon SB-800 (with a home-made grid spot) to it. Then I simply laid another flash (an SB-24) on the ledge above the bank. I set everything up using the remote flash techniques I explained in the last blog and… well… That’s it! I guess it’s all in the flash. Thanks! Hey bro cool info release, thanx! I have questions about speedflashes. I shoot with my Nikon D300 and SB900 speed flash. I will be shooting some skate session here in Phoenix and a few more in SoCal. Should I do an ALL SPEEDFLASH light set up for the sessions? Or should I buy some strobes? I hear that the speedlights will allow faster shutter speed. Also, what is the range for these speedlights (x3)? Last question, would it be best to have on SB900 on camera and two SB900’s on stands (off camera) Or just three off camera? Appreciate all the info bro! Well, to start off, your SB-900 is a strobe. Any “flash” can also be called a strobe, but the term “strobe” is usually used for small flashes (aka speedlights), like your SB-900. Ok, terminology out of the way, strobes will probably work fine for most of your needs. The problem you going to run into is if you’re using the strobes in the daytime in full sunlight. Then they might not have enough power. You can put two or three of them right next to each other, and this will help them “power up” and fight the sun. You can also set them up to work in “High Speed Sync” mode and be able to use shutter speeds higher than 1/250, but this robs them of more power. In fact, if you’re triggering them with your camera’s iTTL capabilities, that will also rob them of even more power. What I would do, if going on a skate-road trip, is take the three SB-900′ (or SB-800’s or older models) and trigger them with Cybersyncs or Pocket Wizards. This way, you’re getting as much power out of them as possible and they will be filing more reliably. That’s a bit harder to do, but if you read the information above, and practice a few times before you leave, you shouldn’t have an problems!